Ben, Liz, and Maggie Zenger are all currently living on St. Maarten in the Caribbean going to medical school. They were hit today directly by Hurricane Irma. The eye of the storm passed over the island and winds up to 200mph plus ravaged the island destroying everything in its wake. God protected the Zenger family by sending both seen and unseen angels to help them survive this catastrophe. 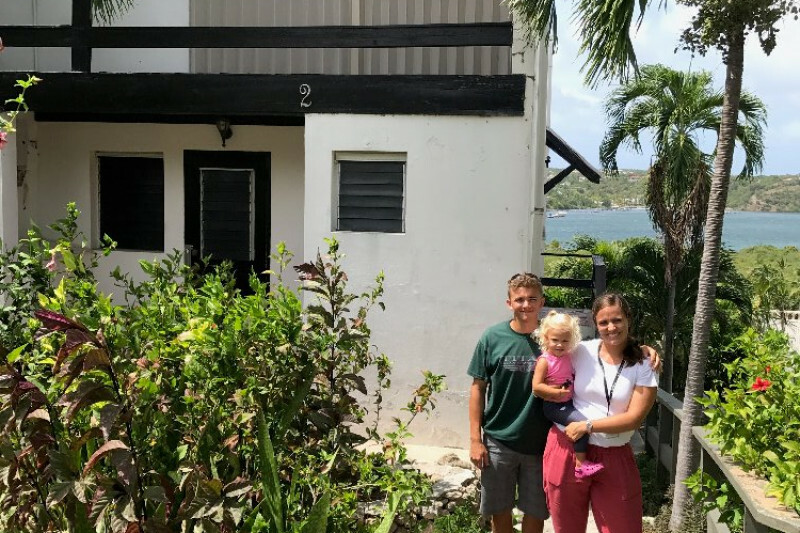 Liz's beloved sister Jessica and her husband Dave were scheduled to visit them when they found out about Irma and its path heading directly for the island. Without them and the faith and prayers from all of you, Ben, Liz, and Maggie might not be here today. Sheltered from the storm inside Ben's school, they miraculously survived without any serious harm to any of them. They realized the miracle that had surpassed after leaving the school following the storm. The entire island had been destroyed. It was as if bombs had gone off decimating everything in sight. Their car, their home, and their belongings are all gone. And the fates many friends and branch members are still unknown. The devastation is indescribable. Without water, power, and means of transportation they are stranded on St. Maarten until rescue efforts can proceed following the passing of the storm. Obviously, life is worth more than all the money in the world, but being the brother to this remarkable family, I want to plead for the help of family, friends, and others to help them come home and rebuild. It will be a costly expense to recover from all that was lost and with Ben's school in limbo, their lives could be uprooted again. The island is all but destroyed, but we can’t wait for the day when they will return home safely. We can't thank all of you enough for all of your incredible support! Wow, we have been completely blown away! Thank you, thank you! And while the Zengers are now home safe, there are still so many left in the devastation on St. Maarten. So we ask for your continued prayers and support of this island as they begin to try to rebuild their lives. I cannot even begin to describe my feelings and experiences the past few days. Just one week ago we were enjoying the beautiful beach of Grand Case. Now I am in Chicago. Hurricane Irma destroyed my beautiful home and life in St Maarten. I will forever be grateful for the shelter from AUC, the prayers said by so many of you, and the countless strangers who donated clothes, food, diapers, water - so my family could get by. THANK YOU for all of the texts and messages we are receiving. Your words of comfort and love mean so much to us. I am now asking that your prayers be turned to the people Irma is affecting now. If it's anything like it was in SXM, it will be devastating. It has been a very humbling experience to see the charity from all of you! Ben, Liz, Maggie, and Dave and Jessica are are experiencing something that they will never forget and will change them forever. Because of your love and support, they will be able to see that there are many, many angels watching over them. I never thought this kind of response and generosity would come from this and I would personally like to thank each and everyone of you on their behalf. I am sure they will be in complete shock when they come to know of this fund and will want to reach out to each of you. It is sometimes hard to accept such generosity, but it is the way in which we can give our love to this wonderful family from so many far off places. For those who do not know, a Facebook page has now been created to provide any updates to their situation. The Facebook page is "Ben and Liz Zenger in St Maarten". With Hurricane Jose laying in wake of the island again, very few changes in their situation have occurred, even though all possible resources have been exhausted to rescue them. They are running out of supplies and the situation continues to worsen, but there is hope and the prayers and continual effort to help them is felt by each of them. Thank you once again. Please continue to pray for them and the people of the Caribbean as Florida and the rest of the country now brace for Irma's impact. We love each and every one of you!